And as many as should look upon that serpent should live, even so as many as should look upon the Son of God with faith, having a contrite spirit, might live even unto that life which is eternal. Today is the last day to vote on the Guide and Standard produced by the seven chosen by lots. The purpose is to see if the body deems the document acceptable as a guide and standard. As I looked at the calendar today, I noticed John Pratt marked two important correlations with this day. 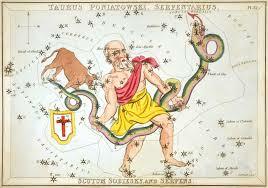 First: Today is a holy day, associated with a star he calls “The Healer” on the star calendar, which is associated with the constellation Ophiuchus, portrayed as a man holding a snake. “The Healer,” of course, points our hearts to Christ, who is the great healer, represented by the brass serpent raised by Moses. Second: Today is Enoch’s day of birth. Enoch is Raphael, whose name means “it is God who heals.” Because Enoch, more than any other, is a name we immediately associate with Zion, may today be the day we can commemorate our hearts first coming together in unity, which is one of the primary requirements for Zion. How fitting a day for Zion to be born, and how fitting a day to remember Enoch. I accept this statement because it teaches the important principles of salvation, using the Lord’s own words from scripture and from the servants He sent. These are things all covenant holders already accept, by virtue of the covenant we made. It also provides ample references and footnotes to guide and assist any who wish to study and learn more deeply. I believe the Lord approves this document. O my brethren, if ye could be healed by merely casting about your eyes that ye might be healed, would ye not behold quickly, or would ye rather harden your hearts in unbelief and be slothful, that ye would not cast about your eyes, that ye might perish?